Get ready, fans of highs schoolers who fight in turn-based battles and are also great dancers. Atlus has officially announced Persona Dancing: Endless Night Collection is leaving Japan. This new Persona Dancing collection puts together all of the Persona dancing games in one package and will available on both the PlayStation 4 and PlayStation Vita. The Persona Dancing: Endless Night Collection physical edition, which is exclusive to the PlayStation 4, will all come in a hardcover art book package covered in Shigenori Soejima designs. Persona 3: Dancing in Moonlight and Persona 5: Dancing in Starlight will be on actual discs, while Persona 4: Dancing All Night will be included as a digital download. It will be $69.99 for the digital Vita copy and $99.99 for either the digital or physical PS4 copy. 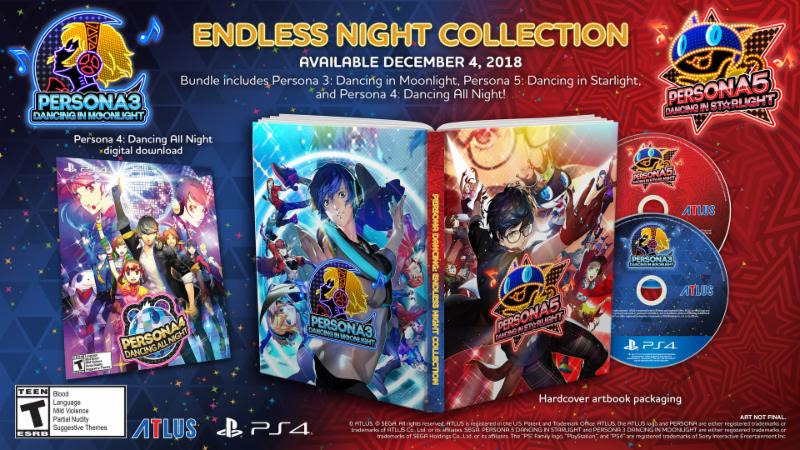 Persona Dancing: Endless Night Collection, along with Persona 3: Dancing in Moonlight and Persona 5: Dancing in Starlight, are available for preorder over at the Atlus website. They will all be released on December 4, 2018 for PS4 and Vita. You can check out the size of each game right here.